In this article, we will discuss the Comparison of B.Tech Fee Structure of top private universities i.e. VIT,SRM and Manipal University. When a student goes for taking admission into a college, money also becomes one of the affecting factors. Sometimes students are not able to get admission into a college because of its high fees and prolonged charges. Candidates who dream of taking admission into top private Universities for B.Tech programme should keep in mind that all these Universities in India charge a lot for the four years B. Tech programme. So, here we will discuss the fee structure of these colleges including the course fee, hostel fee and the hostel facilities provided by the college. So that the students will be aware of the total amount that they have to spend for their B. Tech programme and will financially get prepared before taking admission. Here we are comparing three of the top private Engineering Universities VIT, SRM and Manipal & their Comparison of B.Tech Fee Structure along with Hostel facilities and Hostel fee is given below. Here we are giving a comparison of the full tuition fee for the four-year program including the caution money to be deposited. We are giving the facilities provided by the hostels of these Universities. Candidates should take a look at these facilities and the type of hostel they want to opt for themselves. Hostel VIT: There will be two separate hostels for boys and girls with double and triple bedded accommodation. Optional AC facility is there for 24x7 ambulances, WIFI. Entertainment halls, movie screening, exclusive visitors lounge, solar hot water for bathing. Good housekeeping and green ambience, with ragging free and smoking free campus. Manipal University: In MIT there are separate blocks for girls and boys hostel. Each block will have a fixed capacity. There will be a range of accommodation options to choose from, for students’ convenience. Like for first-year students, they can only choose from double and triple seated rooms. Candidates are also provided with the access to the TV rooms, and other sports/leisure activity rooms. SRM University: There is a wide variety of hostels to choose from that suit every budget for SRM University. The students at SRM are provided healthy and sumptuous food options at highly subsidized rates. For the benefit of our international students, the hostels also offer a multi-cuisine dining facility providing Thai, Chinese and continental food. The students are given the facility of a gymnasium, playground and all indoor gaming activities. All these Universities will provide hostels to all the students. 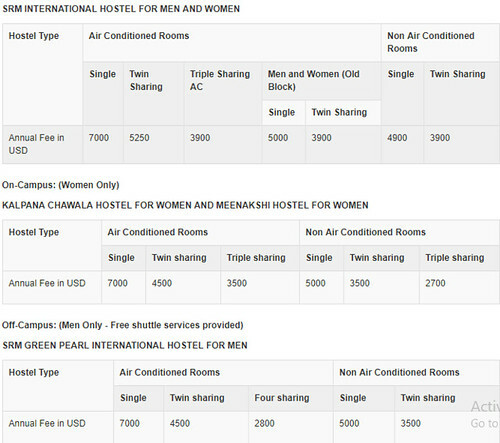 The hostel fees for the NRI candidates will be different from the Indian Candidates. The charges will differ according to the choice of the candidates for single, double or sharing rooms. 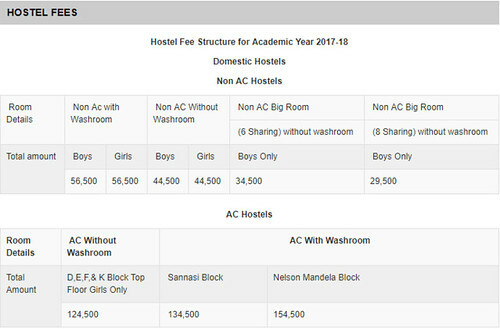 In VIT there are different hostels for boys and girls, but the fee structure will be same. For the NRI Candidates also, the fee structure will be different. In Manipal University also, there are separate campuses for girls and boys. The fee structure will be different for general and NRI candidates. SRM University also has different hostel facility for NRI candidates. It is although a bit expensive but affordable too. For any queries related to the BTech Fee Structure of Top Engineering Universities, You can write to us in the comments section below.